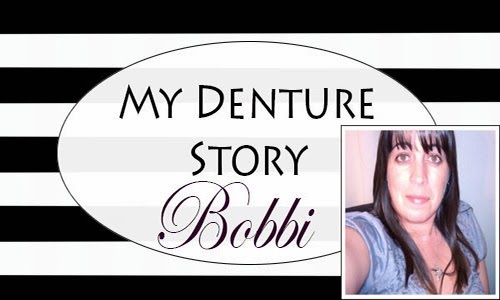 Bobbi’s Denture Story | iweardentures! 33y/o married mother of two children 13 & 11. I am an Emt and work in a busy ER. What Caused you to need dentures? How did you find your current dentist and how did you find him/her? I saw aÂ commercial on TV advertising sedation dentistry for people who suffer anxiety over going to the dentist. I have been to many dentists. I wish I would haveÂ flung this dentist years ago. The experience as soon as you walk in the door is outstanding. They did everything they possibly could to help me figure out how I was going to manage to afford fixing my teeth and took their time explaining in great detail the who’s the what’s and the why’s. I will get my fix in stages. First stage costs 7,000.00. Second stage will come a yr later no price yet. What type of work will you have done? First stage is upper denture after 13 extractions. Second stage is a lower partial after making improvements to natural teeth. Very nervous, anxious, most of all scared. My husband took out a line of credit so I could get this done. Also have my mom who has had her upper denture since she was 17. However, they will cost you with an additional fee for this immediate assistance since you will get the cash on the same payday loans chicago day that your system was approved.